I’ll start from the start..starter. Since this beer was going to be so big, a single packet of wyeast was not going to be enough to get this beer off on the right foot. One packet of wyeast contains 100 billion cells, which sounds like a lot, but according to www.yeastcalc.com I was going to require +400 billion yeast cells. 4 times as much! This is where the starter comes into play. 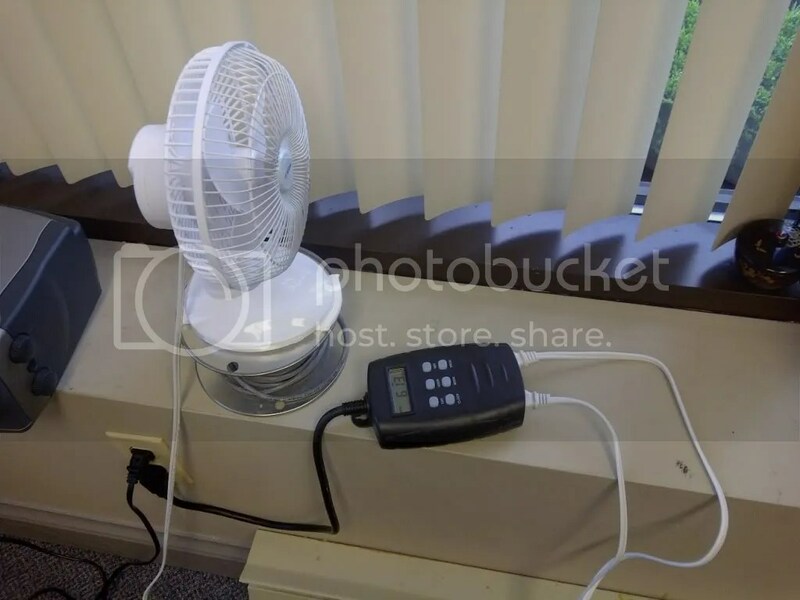 I used a 2L Erlenmeyer flask, a stir bar and a stir plate that I made with some magnets and an old computer fan. 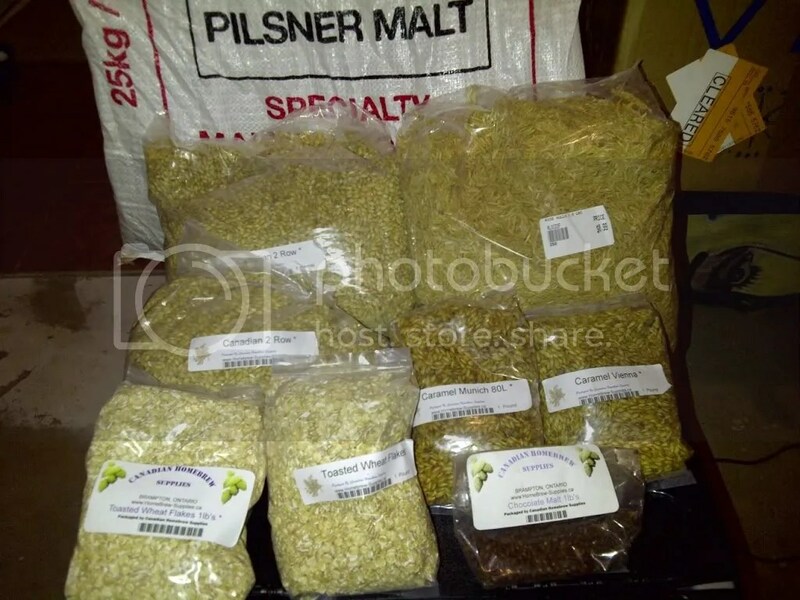 Basically I made a mini 1.5L batch of beer with some Dry Malt Extract and pitched in the wyeast package. 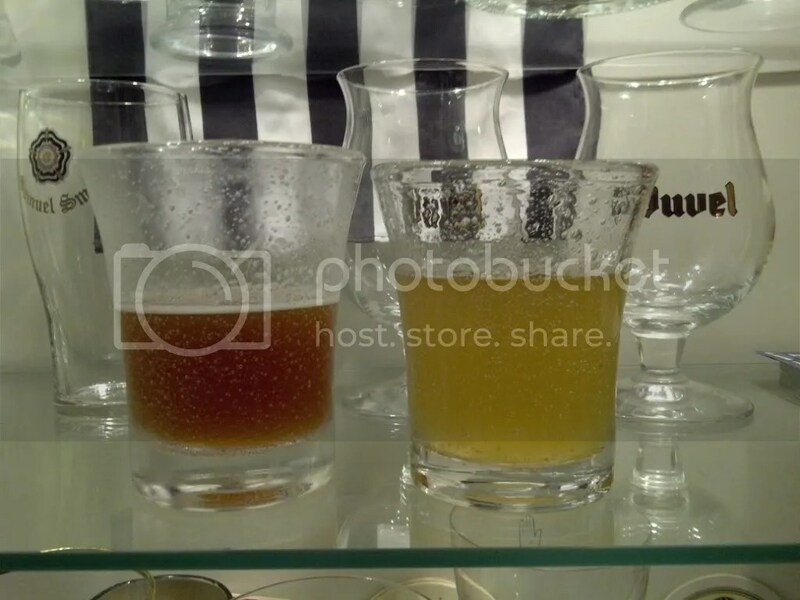 I spun the mini batch with the stir bar for 24 hours, put the flask in the fridge for another 24 hours (to settle the yeast to the bottom of the flask), then I made a second 1.5L mini batch and added it to the flask. 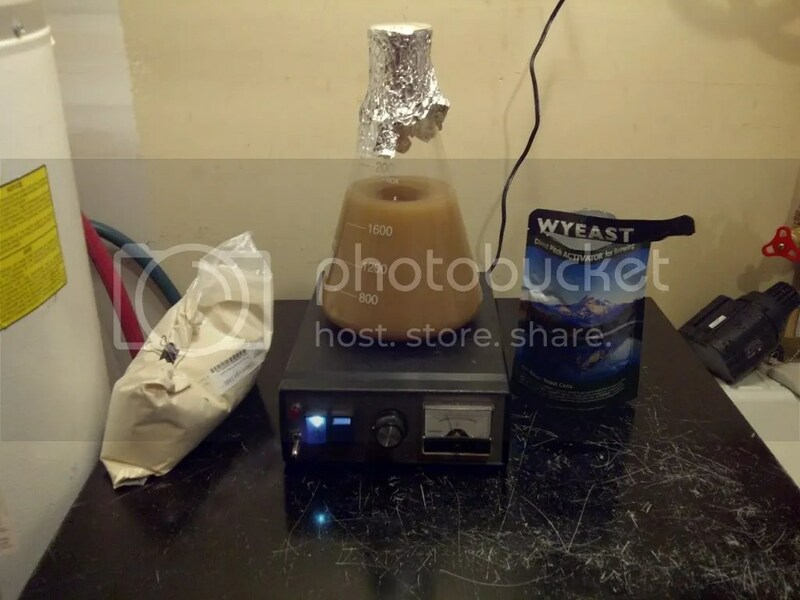 Again I spun that on the stir plate for 24 hours, again put it in the fridge for another 24 until I had finally finished growing just over 400 billion very active and fresh yeast cells. Stir plate in action. Dry malt extract to the left, wyeast packet to the right. So why use a stir plate? Well without it the yeast tend to sink right to the bottom where they aren’t exposed to the fresh wort. The stir plate keeps all the yeasties in the action as well as keep the wort well oxygenated which helps yeast grow. With plenty of yeast now ready to go, it was off to the mash. 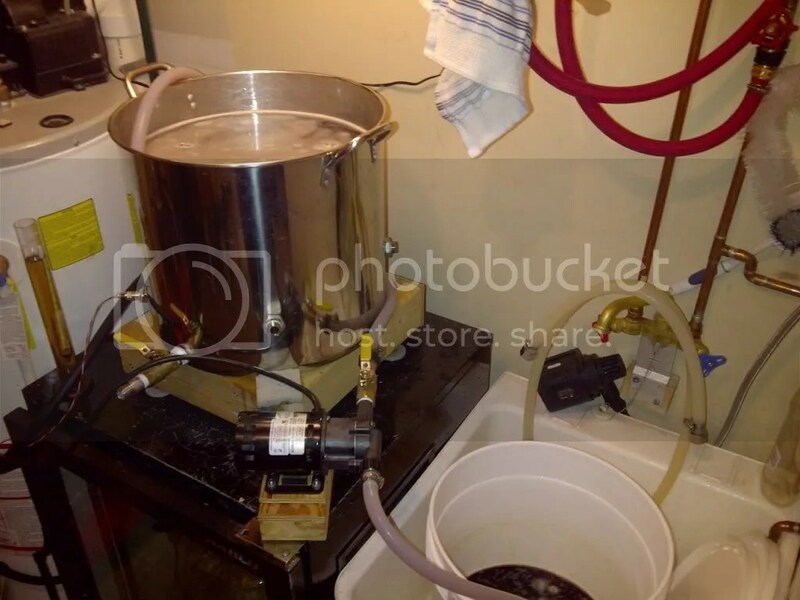 The first thing I did was fill my boil/hot liquor tank with 10 gallons of filtered water. I also added in a half of a campden tablet which removes chloromines that are present in the water thanks to Hamilton waterworks. I then set the temperature controller to 152F and left the water to heat up. This recipe was quite ambitious at 21 lbs of grain. I was a little fearful that my 8.5 gallon mash tun was not going to hold all of this grain, but very carefully I managed to fit it all. I put my Victoria grain mill on my little cart with the mash tun right underneath. I weighed all the grain and ground up 2 lbs at a time (size of the grain mill hopper). 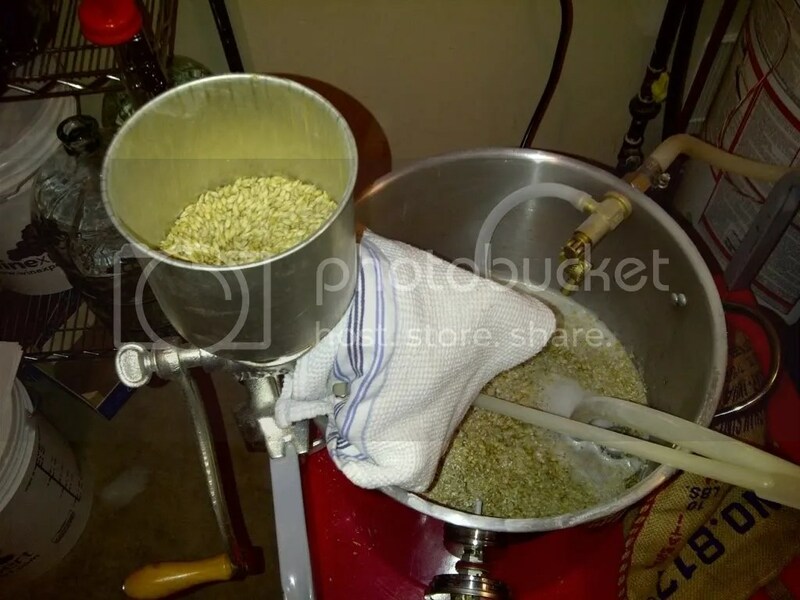 Every 2 lbs of grain I added some heated water, repeating the crushing and mashing all the way up to 21lbs. It was kind of like making a layer cake of grains. I did it this way because trying to mix that much grain with water would be a very tough activity which would probably result in a lot of dough balls. 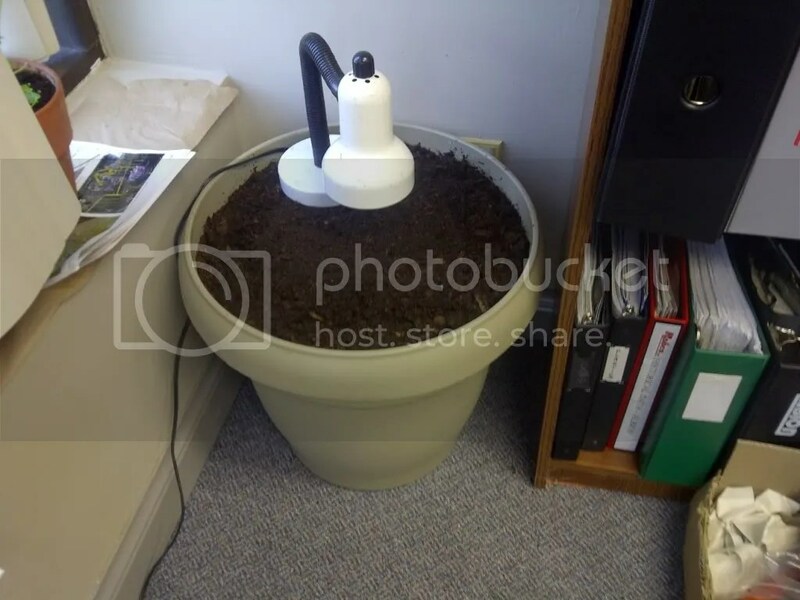 This method also let me mix in the minimal amount of water needed which helped compact the grain so that it all fit well. 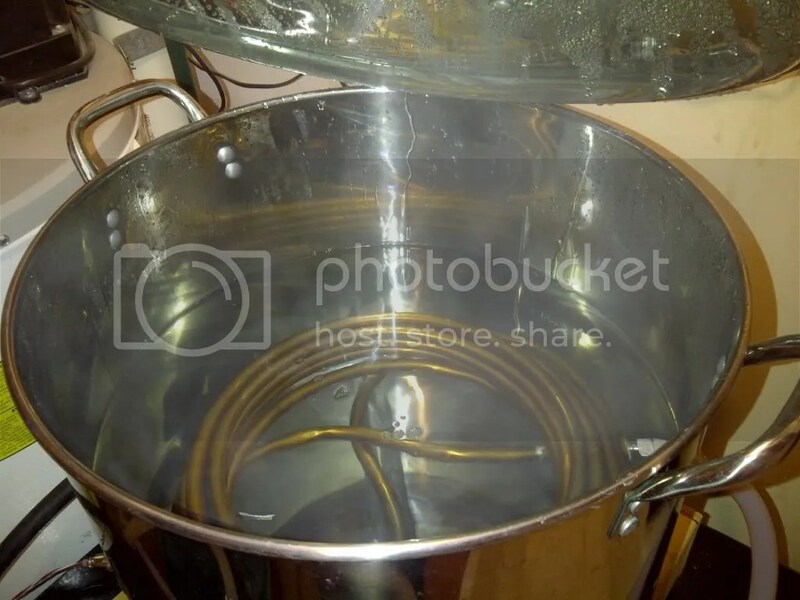 All the while I had been running the pump to drain the added water in the mash tun, circulate it through a copper coil that is installed in my boil/hot liquor tank, and then pumped back to the top of the mash tun. This allows the mashing water to be reheated to the same temperature of the water in the boil kettle. Slick! Mash tun with the grain mill to the left. The copper manifold at the bottom collects the wort. Grain mill with grain in hopper, tea-towel to keep dust and ground bits from flying around. Mash tun is full. 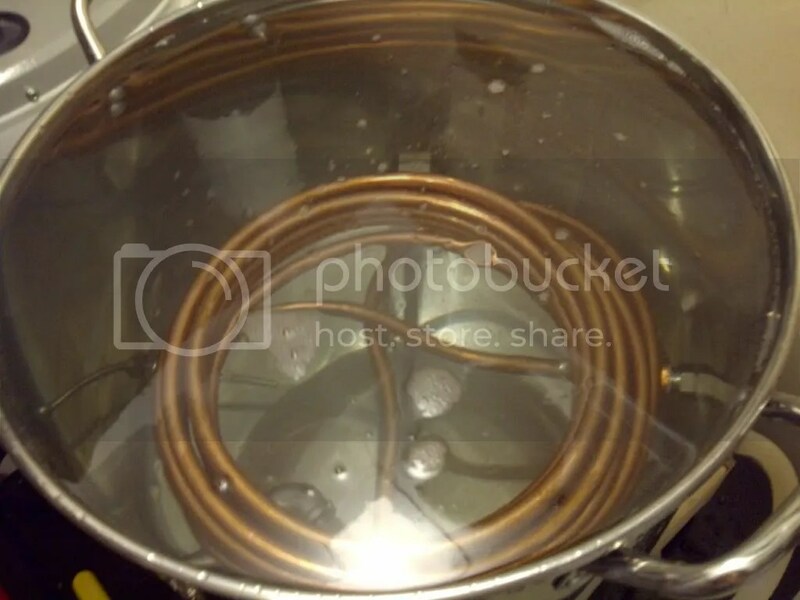 The silicone tub is connected to the copper coil in the boil kettle – this returns the wort to the top of the grain bed where it again drains to the manifold and gets reheated by the copper coil again. Recirculation. This keeps the grain at a consistent temperature. Notice the wort is very dark looking now. The mash tun on the cart wrapped in a towel to reduce heat loss. Notice the pump at the bottom of the cart. This is what pushes the wort up to and through the copper coil in the boil kettle. The boil kettle is on the fridge doing its thing. Hot water in the boil / hot liquor tun. 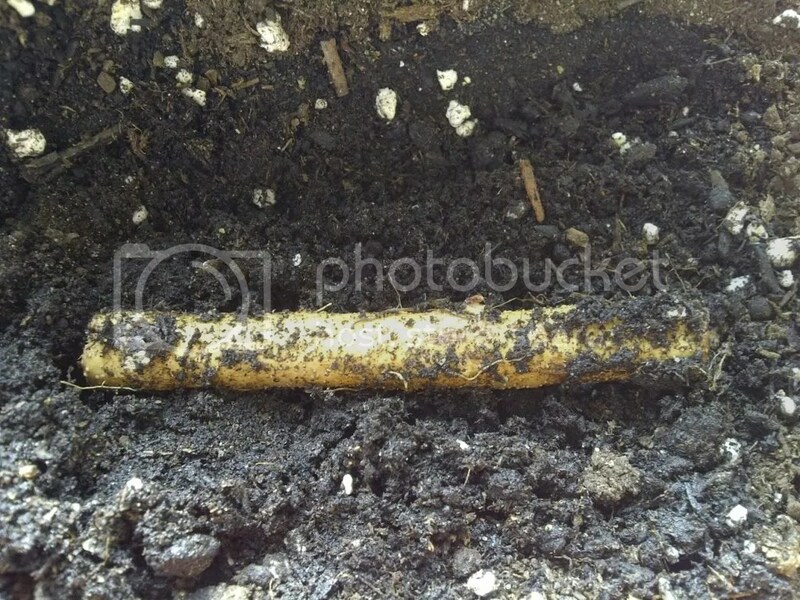 Again you can see the copper coil. With the grain all added in and mash water/wort recirculating, all I had to do was wait. I kept the mash tun at 135F for 30 minutes during the mash-in, then up to 150F for 60 minutes, 152F for 10 minutes and then finally 165F for 15 minutes for the mash out. During the mash out I slowly drained the wort from the mash tun into a bucket while simultaneously adding the fresh water to the top of the mash tun. This step is called sparging – it is done to rinse the grains of remaining sugars so that you get all the good stuff. With a 15 minute sparge I ended up with 10 gallons of hot wort, which was a little more than I would have liked. 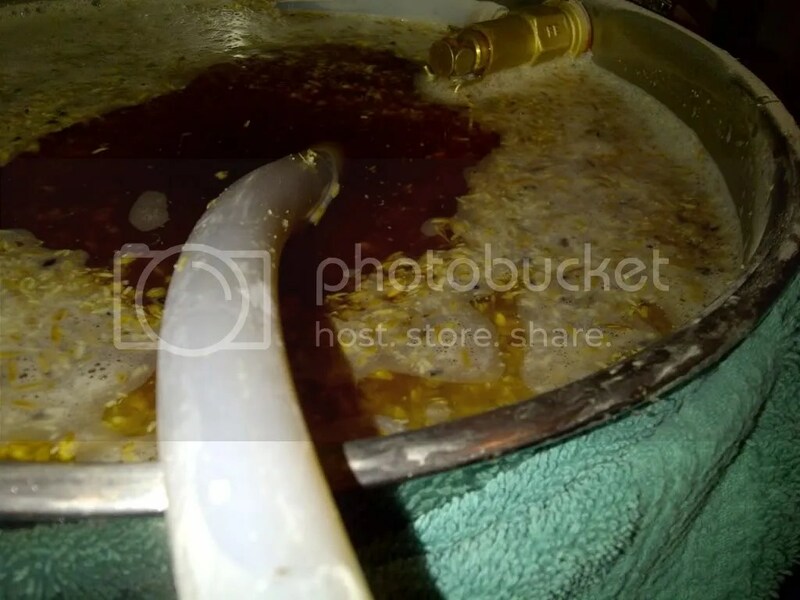 The next step was then adding all of the hot wort into the boil kettle. I could have simply lifted the buckets up and poured them into the boil kettle, but I opted not to for two reasons. Firstly I thought it would be dangerous to lift hot sticky sugar water above my head, and secondly I wanted to avoid hot side aeration which can cause off-flavours later on down the road. So I hooked up my pump and transferred the wort to the kettle. 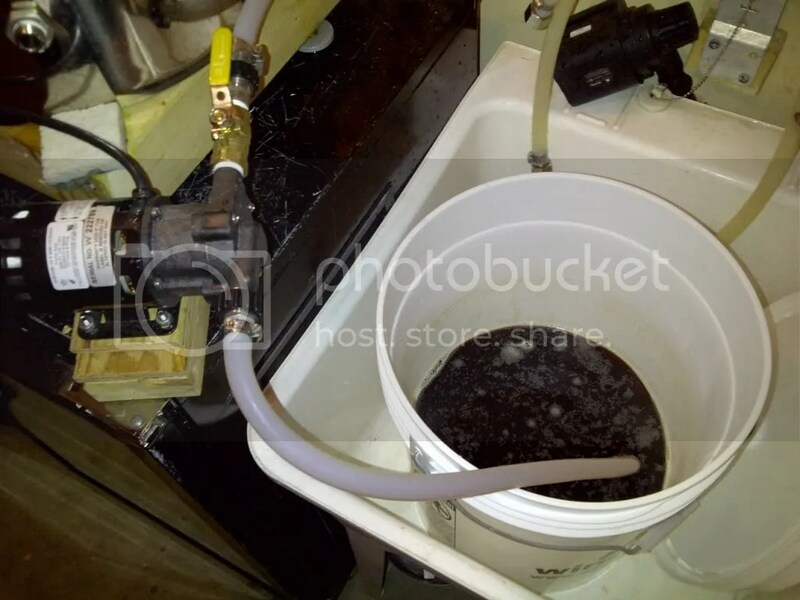 Dark wort in the bucket with the pump to the left. Boil kettle almost full of wort. Now this is where things got a little dodgy. I didn’t take any pictures of the boil because things got a little intense. First off I had an incident where the hose that was filling the boil kettle with wort whipped out and spray the walls and my entire body with hot wort. That was NOT fun. 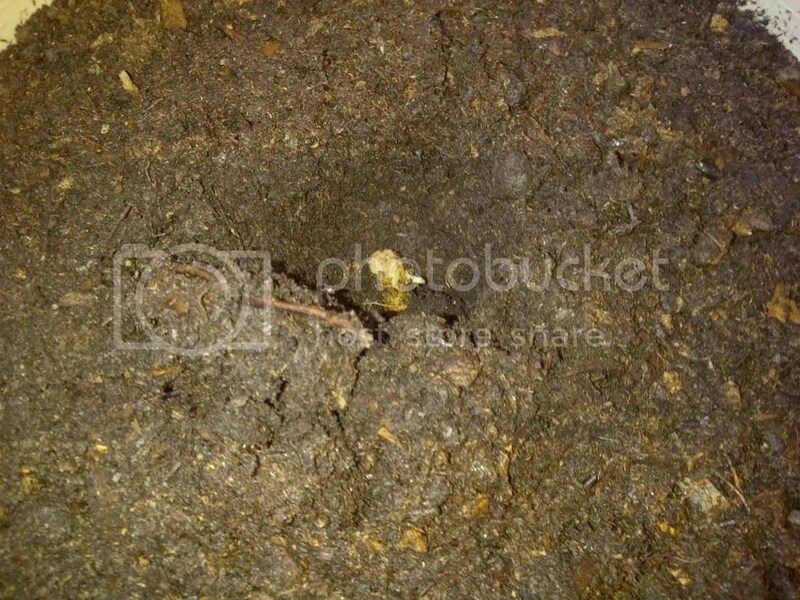 While I emerged uninjured I was extremely sticky. Normal wort is not so bad, but this stuff (being a barley wine wort) was just silly. 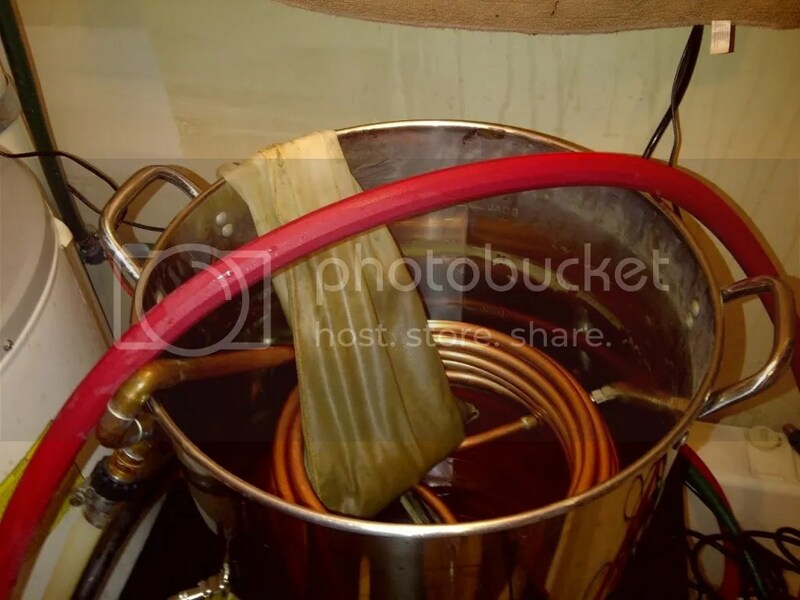 The next problem that I encountered was that I had too much wort in my boil kettle. Now I did have a secret weapon to eliminate foam and any chance of a boil-over, and its called Fermcap. This stuff is literally magic! It is a surfactant that completely removes foam so that you won’t have to worry about boil-overs. Unfortunately I still had too much wort. 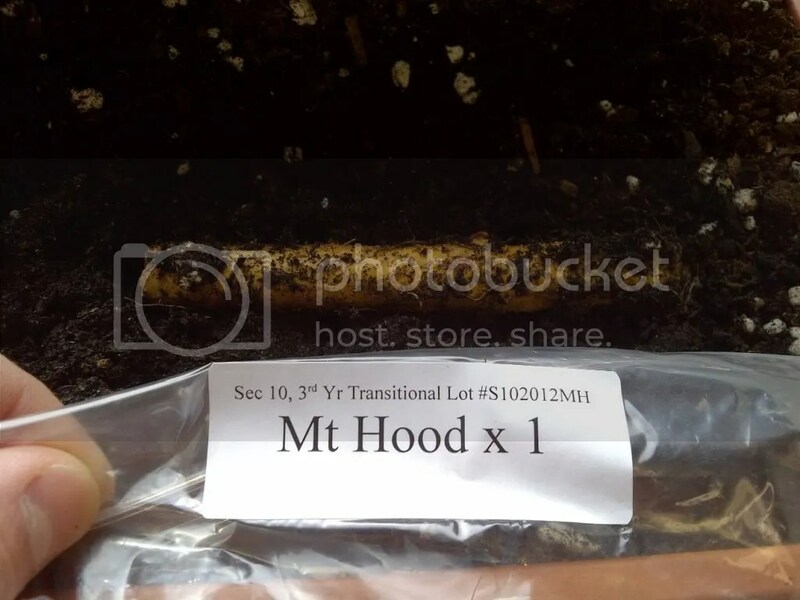 I had to get down to 6 gallons from 10+, and I still had to add in the 2kg of dark candi sugar. But, everything eventually went back on track. I managed to boil off enough liquid, add all the hops on-time, add the dark candi sugar as well as the whirlfloc and yeast nutrient. In the end my boil was a little longer than I wanted it to be, 120 minutes, but so it goes.. The chilling of the wort was next. 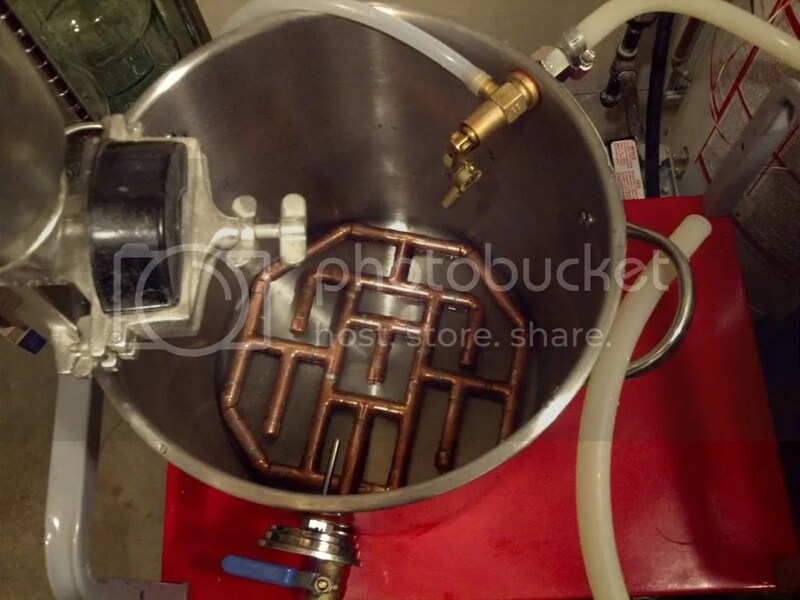 I rigged up the boil kettle to the pump and then to the chiller which is cooled by tap water from the garden hose. Its a nifty gadget. And to sanitize the entire chilling system I just recirculated the boiling wort for the last 15 minutes of the boil through the systen and pumped it back into the boil kettle. When the boil timer was up, I turned on the cold tap water to cool the chiller, and pumped the rapidly cooled wort into the carboy. The chiller is the red hose coil. 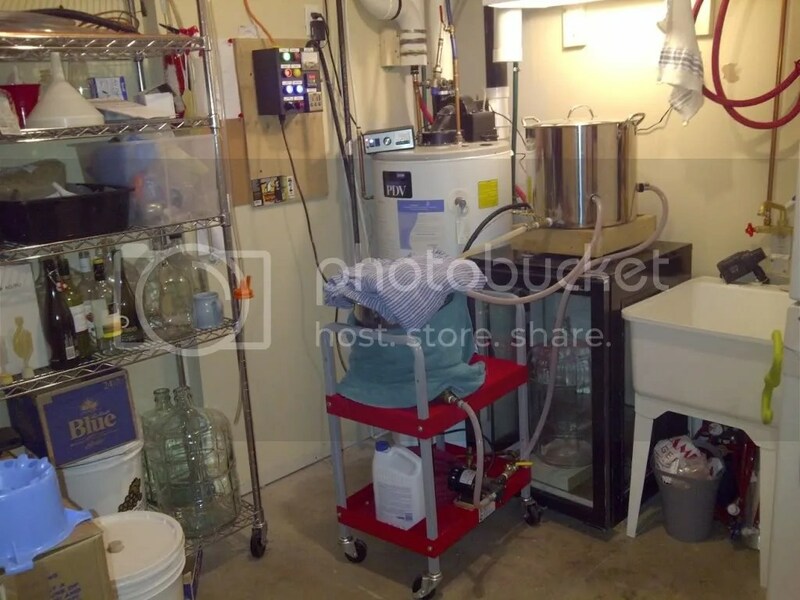 The red hoses are for the cooled tap water and the silicone white hoses are for the wort. Glass carboy filled with cooled wort. Unfortunately this sticky mess was left for clean-up. Notice the bag sitting in the boil kettle. 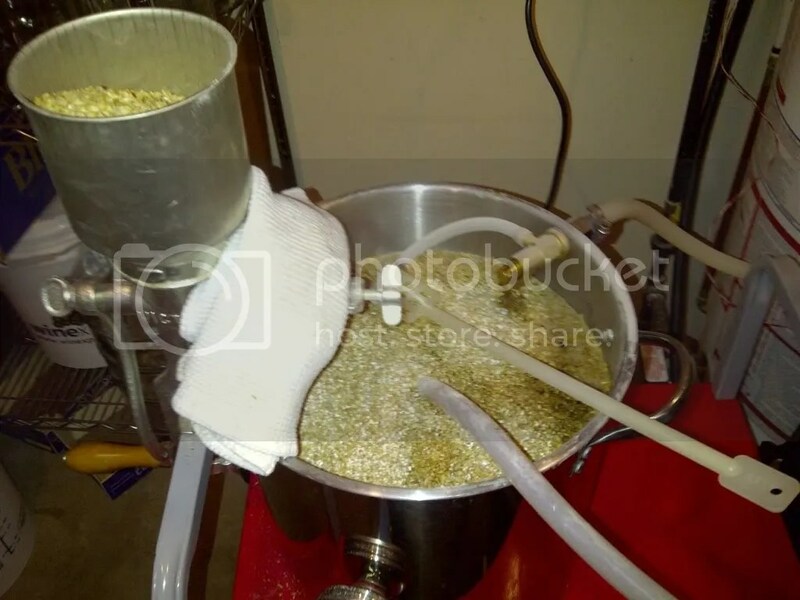 This is what I put the pellet hops in so that they don’t clog up the valves and chilling system after the boil. Next step, aeration. The cooled wort has to be aerated for the yeast to get to work. I use to just hold my carboy like a baby and vigorously shake it about, but I decided that this was a bad and unsafe practice. 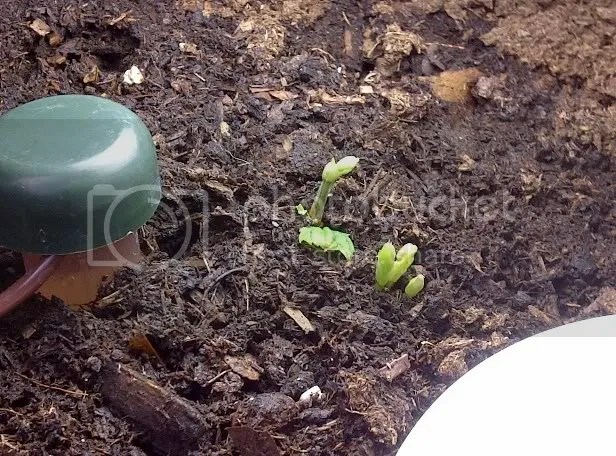 So I ended up getting a small aquarium pump and an aeration stone which will easily aerate the wort in 15~30 minutes with no shaking required. 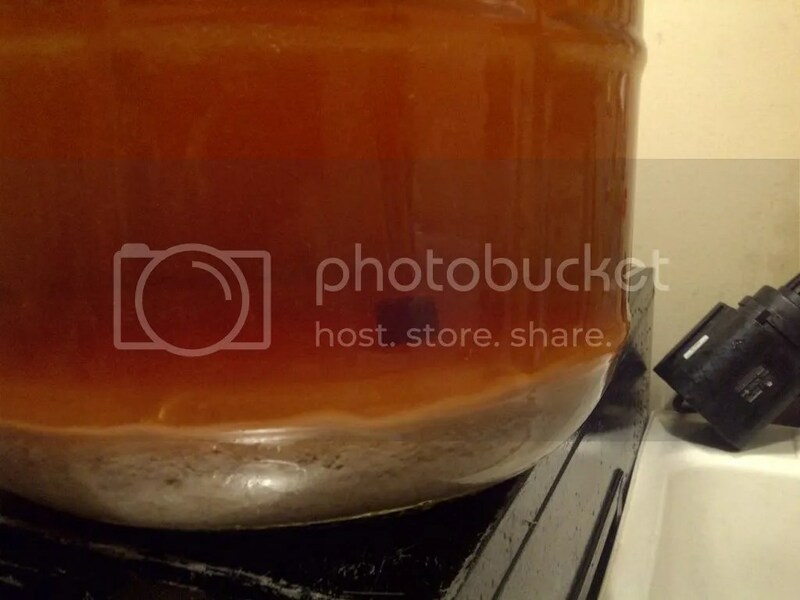 After that, the yeast was pitched into the carboy. 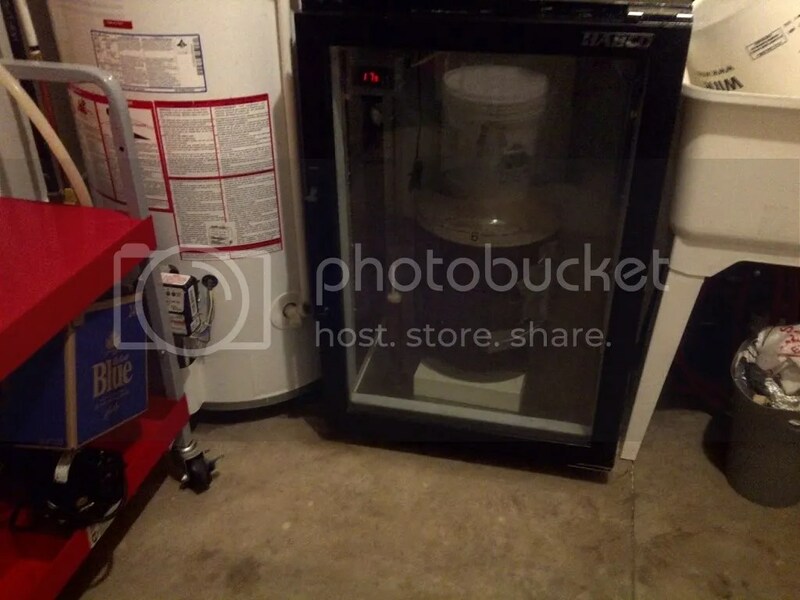 As a sort of a side note, I ended up getting a 6.5 gallon larger carboy off of kijiji for $20. 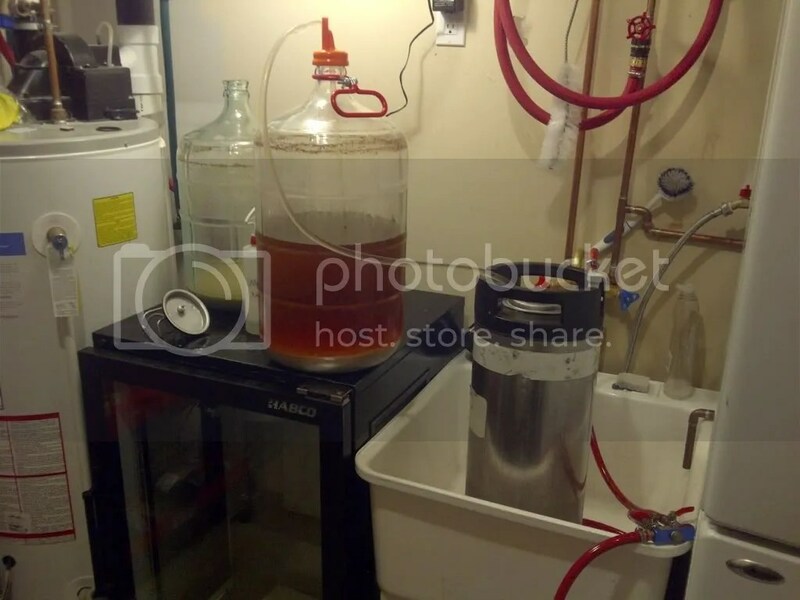 This carboy is has that extra space which is required for the foamy krausen to do its thing and hopefully not have any issues with blow-offs. 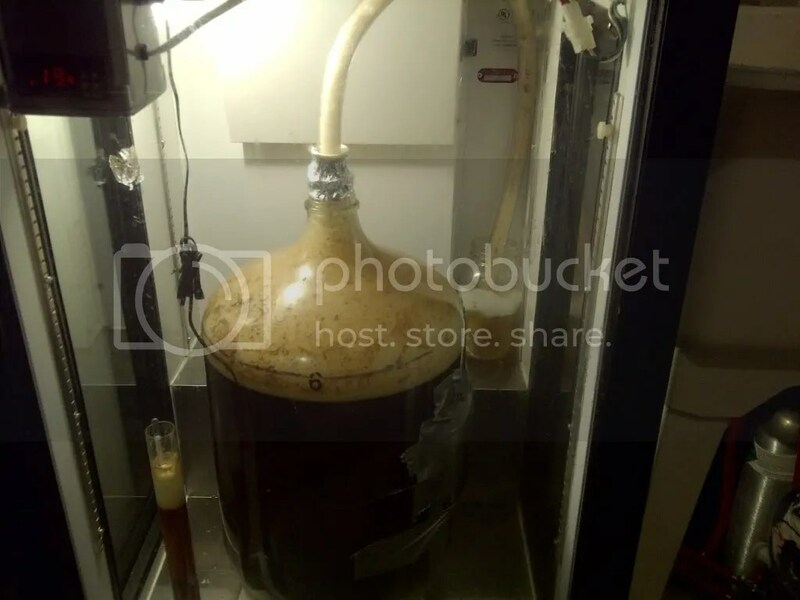 You will notice the black tube that goes from the top of the carboy into the black madness and is connected to the aeration stone that you can see near the bottom of the carboy. This little guy just burbles away and makes a nice rich creamy foam on the top of the wort. 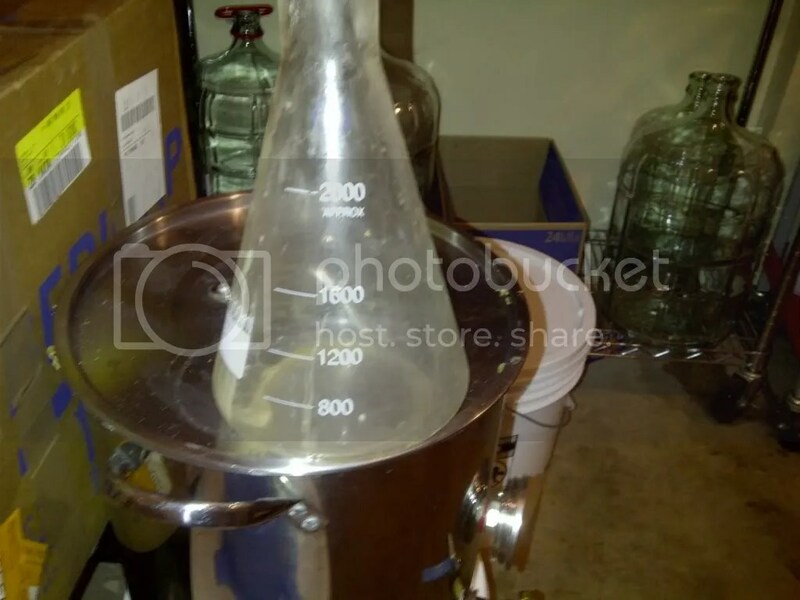 Erlenmeyer flask after the yeast was pitched in the carboy. And that would seem like the end of the adventure, but it wasn’t. 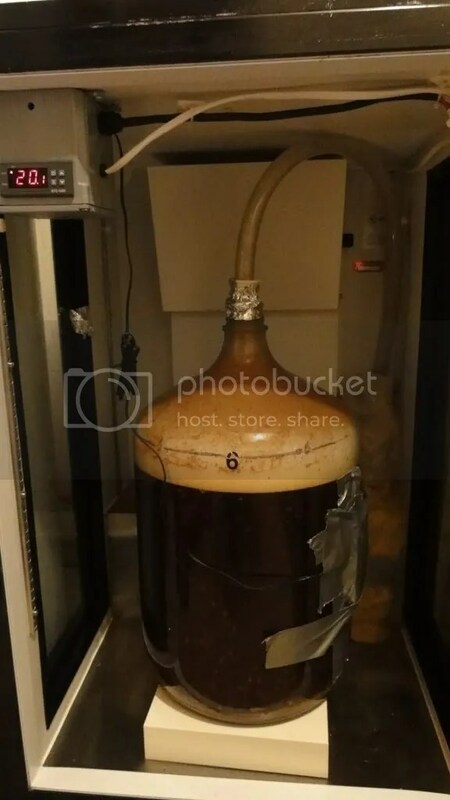 I placed the carboy into my temperature controlled fermentation chamber (a fridge) and set it at 18C. 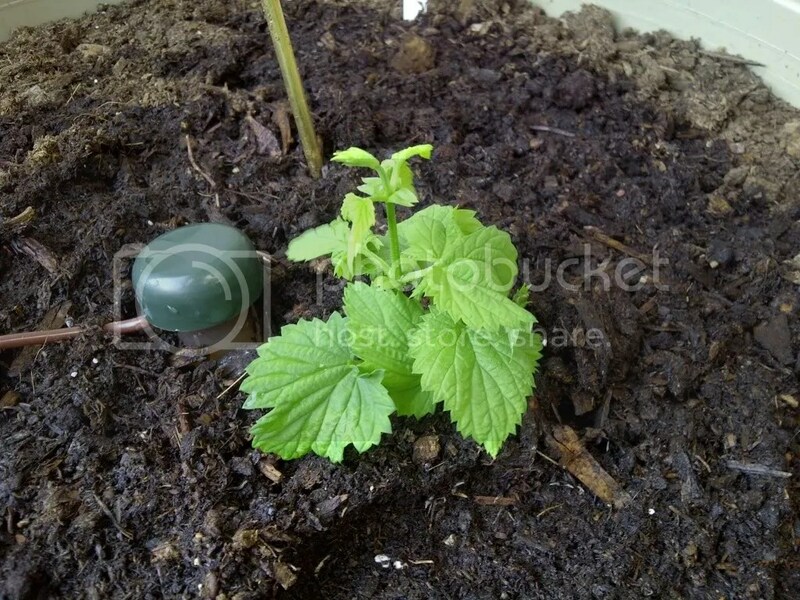 My plan is to rise this 1C per day until I get to about 25~26C and hold it there. After consulting with the “Brew like a Monk” book, I have decided to follow their suggestions for temperature. Start low and rise slowly. The higher the temperature, the more the yeast become active and split out all the funky awesome esters. But, too much too soon can make a wild and uncontrolled tasting brew. So I’ll give it a shot. Carboy is in the chamber. 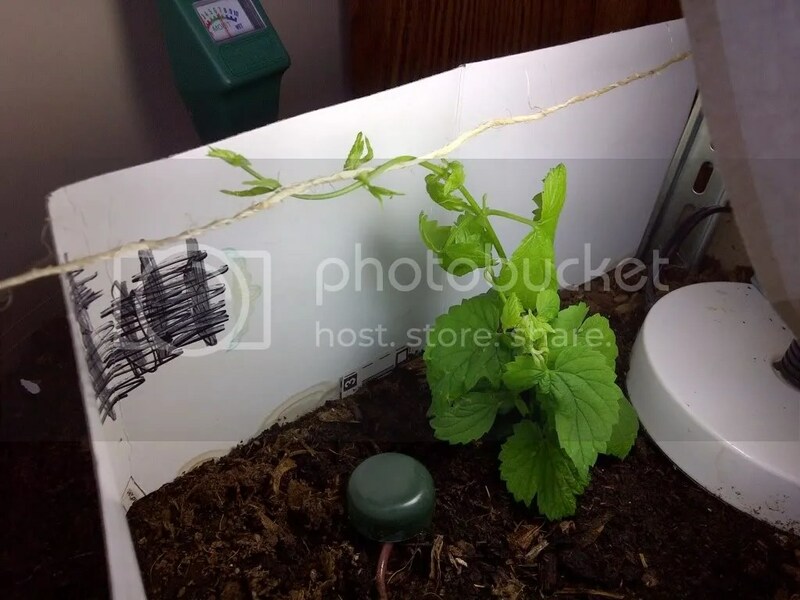 The temperature probe is taped to the side of the carboy with a piece of foam for insulation. It was very hard getting a gravity reading because I swiped a sample from the yeast-ed carboy which had begun fermenting. This cause foam that I couldn’t get rid of in the sample tube. But I think its around the 1.120~1.130 mark. I left this sample beside the carboy in the fridge because I can keep a rough idea of how the brew is progressing. Just 4 hours after I pitched the yeast I could see visible signs of fermentation. That’s fast! The yeasties must be very happy. Where I shined the light you can see particles which were swimming around. Before I went to bed that night I decided to bump the temperature up to 19C. When I awoke next morning, giddy to see the fermenting Belgian Bomb as if it were a Christmas present left by Santa, I rushed down to see what was going on. Excitement turned into a hurried rush to attach a blow-off tube. I had initially installed a small airlock on the carboy thinking that this extra big 6.5 carboy would have been big enough. Well I was wrong. Very very wrong. The airlock was distinctly dark in colour as the foam had traveled up and filled it. It was completely plugged up, so I started to remove the rubber bung. I heard a hiss coming from the carboy, and learning from a mistake a year ago I just held the rubber bung in place and let the hissing stop first. Last year I just pulled the bung out and I was greeted by a gigantic spray of beer and foam. It would have been way worse this time because the amount of pressure that had built up in the carboy was tremendous. I probably would have found a fridge full of sticky mess, but I was lucky! 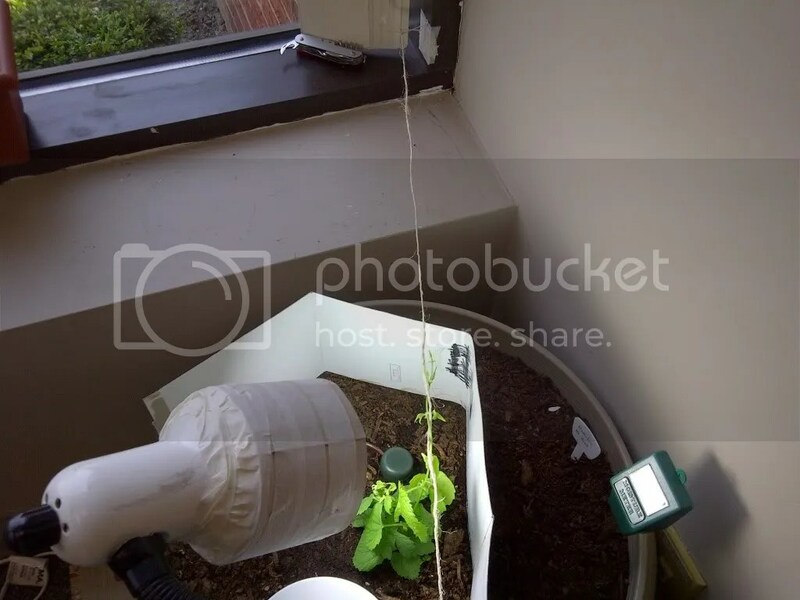 So I rigged up the blow-off tube, which is just a bigger hose that runs into a jar of StarSan sanitizer. Immediately I saw foam being ported through the tube. Let me tell you, when you see an airlock burbling away that is nothing to what I was seeing here. The blow-off tube was just mercilessly spewing out co2 with a vengeance. I decided to take a video to show the power of the Belgian Bomb! 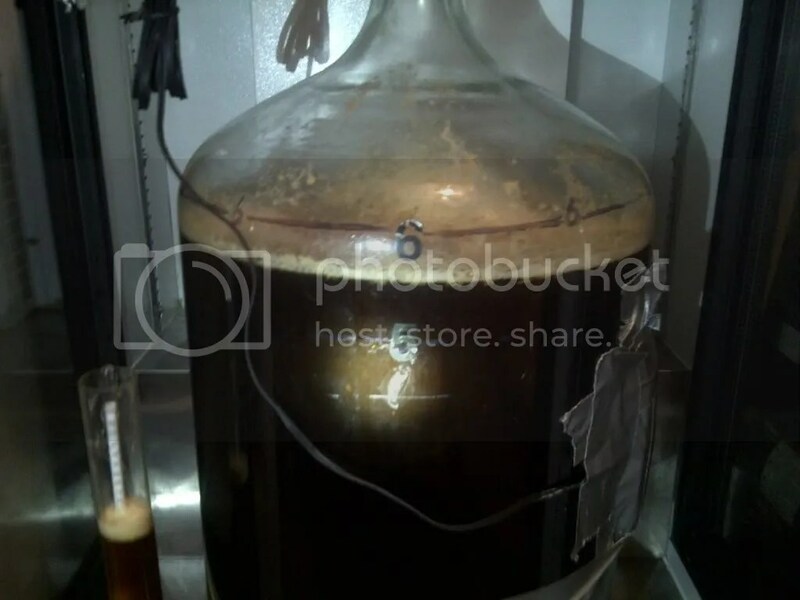 Carboy head-space completely filled with foam, foam in blow-off tube and foam in the blow-off jar. This all happened in less than a minute of attaching the blow-off tube. 19C. I don’t know what to expect when I get home after work tonight, but I’m expecting more intense fermentation, especially as I raise the temperature. If this thing makes it out of primary fermentation, it will be spending a long time in secondary/bulk storage, probably six months to a year. I may even add some champagne yeast later on down the road if I am having trouble getting the final gravity down. If that doesn’t work I may decide to use a bit of Amylase Enzyme or Beano, which will convert some of the unfermentable sugar into fermentable sugar. But I will consider these options at a later date. ‘Till then I have to put on a monk robe and watch the fermentation closely. The blow-off jar was overflowing with foam and the bottom of the fridge and the floor was covered in sticky beer/wort. What a mess. I cleaned it all up and replaced the blow-off jar with a fresh one. When I woke up this morning I didn’t see anymore excessive foaming, so hopefully that episode is over. I increased the temperature to 21C this morning after sitting at 20C all of yesterday. 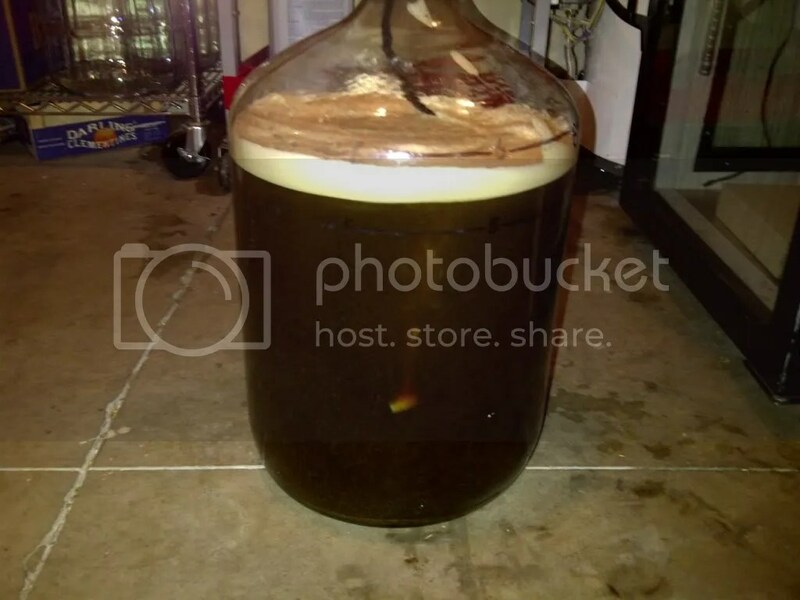 The sample in the test cylinder is also fermenting along with the brew in the carboy. 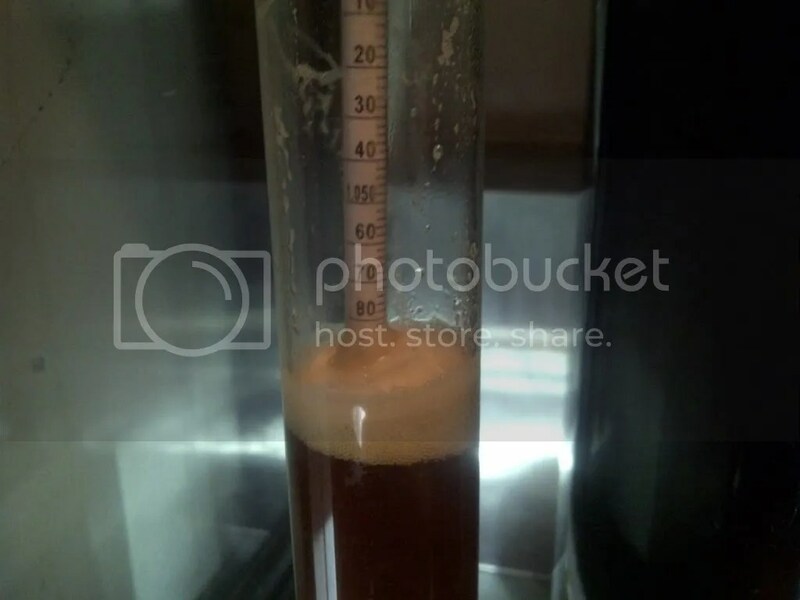 I left the hydrometer in it and I am noticing that the gravity is dropping steadily. I expect to see the gravity drop faster as I ramp up the temperature. Here’s another video of The Belgian Bomb fermenting away. Notice the amount of co2 being pumped into the blow-off jar. Intense and hypnotic! ***I can’t upload the video right now because of computer dumb..
CO2 bubbling has reduced to a bubble every 1~2 seconds. I can probably remove the blow-off tube and replace it with the airlock – perhaps tonight. The gravity in the sample cylinder is around 1.050. The final gravity was listed at around 1.030, which is pretty high, so it may be finished soon. I will see how things progress and where it slows down. I might do a test on the sample cylinder with some crushed beano to see how far down the gravity will drop. I am a little fearful as I don’t want the final gravity to go to 1.000 or it will be bone dry and weird tasting. Bumped the temperature up to 22C.